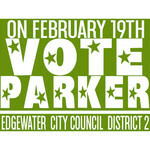 Jennifer Parker for Edgewater Council DIstrict 2 hasn't added a story. Hello everyone and thank you for taking the time to view my campaign page and see what I’m all about. If you haven’t already heard, district 2 council woman amy vogt abruptly vacated her seat leaving the city of Edgewater a bill of over $18,000 to establish a special election to refill her seat. So why am I running? Why take on a city in turmoil? Because I, like so many of you, am raising kids in this area, and I want a future in this area. When I moved to Edgewater I planned on being here for the long haul. The city has all the great makings for a lifetime home. The beach is 10 minutes away, the river is just foot steps away for some, and the housing options are plentiful and, for the most part, cost effective. Right now there are some bad decisions being made. There’s a rental program being discussed that would be costly not only to our city, but to landlords and tenants. There are developments that our town and roads and environment are not ready to handle, being passed right through. The excuse is councils before them approved the development, but if all we do is continually blame our predecessors instead of actively cleaning up after them, nothing will get accomplished. What edgewater needs is a fresh perspective, and some positive change. My goal, if elected is to push the brakes on some of these projects and move some focus to solutions and incentives for developing the areas along us1 that have been for sale for years. I want this town to be a place I’m proud to raise my kids in. I want this town to be a town businesses feel safe starting and developing in. I believe in Edgewater, and I believe with all of your help, we can change this town. The special election takes place February 19th, so we have to hit the ground running. All donations collected will go towards getting the word out, ordering printed and digital materials for voters to learn all about our campaign, as well as a Party after the Polls event on the Special Election Day to celebrate everyone getting out and voting! Thank you everyone for your love, support and contributions! Jennifer Parker for Edgewater Council DIstrict 2 hasn't posted any updates yet.